Update 1/7/2019: The discussion below follows all the news that was coming out when the Nemo Switchback was announced. Since this discussion was started the Nemo Switchback has officially been released and you can see my first impressions with it here. More coming out of the #OutdoorFN on Twitter! 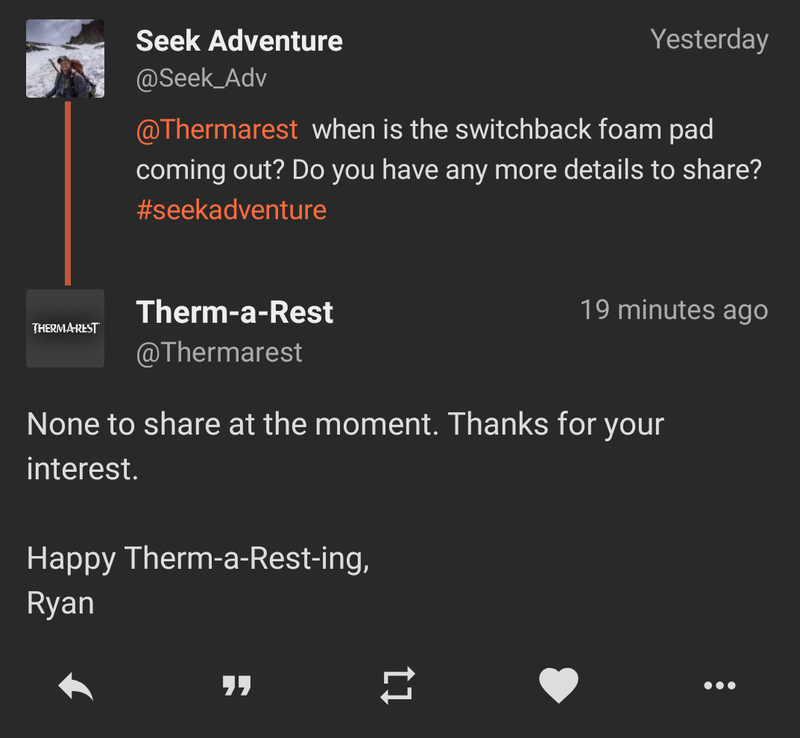 This time it looks like Nemo Equipment is releasing their own competitor to the Thermarest Zlite. The Zlite in my opinion from Thermarest is the only good foam sleeping pad because it folds up instead of roles up and is actually kinda comfy in addition to being super light. The tweet claims it will have a 1.5 times thicker sleep surface than its competition which I can only assume is the Thermarest Zlite. 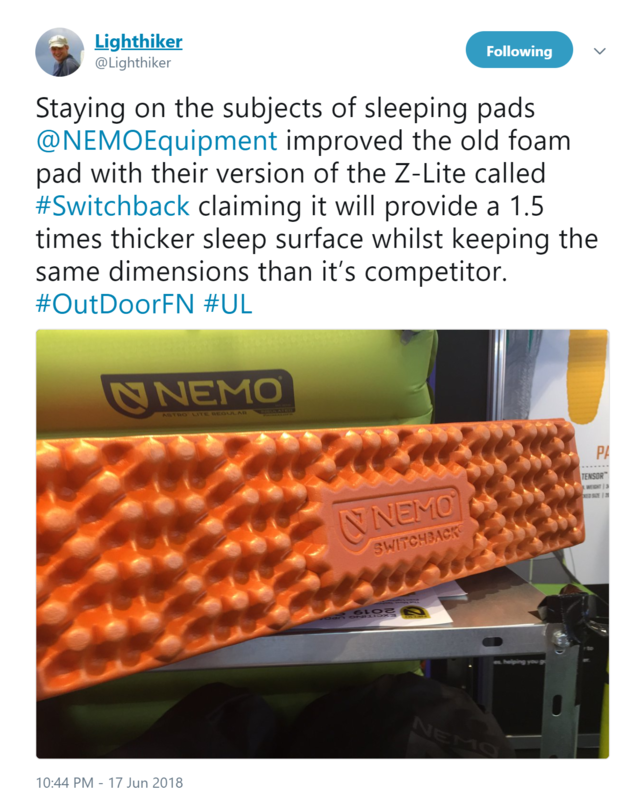 Very curious to see when Nemo releases more information on this sleeping pad, after a quick Google I did not find anything other than this tweet. Not sure how I like foam sleeping pads, seem to bulky for the weight savings, but it is always good to see Thermarest Zlite will have some competition now. CaliHiker Foam sleeping pads are great when you are on the go, and trying to be quick. It takes two seconds to fold up my Thermarest Zlite while cleaning up or setting up camp. All the inflatable sleeping pads are definitely a bit comfier but can not match the foam pads in set up and clean up time for camp. You also do not have to worry about punctures, they are a bit more indestructible and make great camp seats around a fire. JoBo2018 I think its funny that they replied and Nemo Equipment (Company actually making it) hasn't replied to my tweet yet lol. It looks like you can finally purchase the Nemo Switchback! For some reason, you can see it on the Nemo website but you can not purchase it there. To purchase the Nemo Switchback you have to buy it from the REI website at the time of writing this post. REI also says they do not ship the Nemo Switchback internationally at this time. Lastly, I just purchased it and will post a comparison of it with the Zlite Sol and my initial impresions.